I've tried making a few more paracord neck lanyards and I'm starting to get the hang of them. 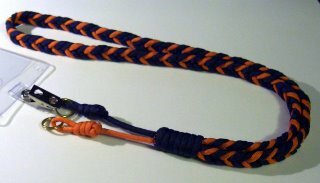 If you want a nice professionally made one, check out Widgnwhackers custom made lanyards. 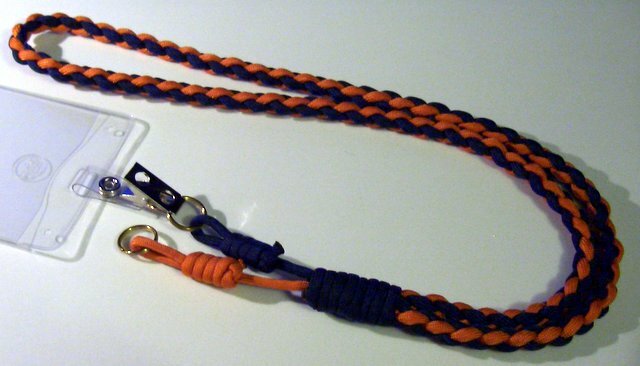 Here's a couple Auburn Tiger flavored neck lanyards I made for some 'War Eagle' nuts in the family. One in the diamond braid and the other my first attempt at the 5-strand plait. The Book of Decorative Knots by Peter Owen has some great diagrams on 'how to' tie various decorative knots. Any thoughts about how to put a breakaway fitting in this type of neck lanyard? I'd like to make one a bit lighter than the cobra stitch breakaway you showed. @Rob, To add a break-away to these types of lanyards, you might try tying them as shown first, then cut the cords in the middle of the lanyard. Flatten out the cord ends by removing some(1/4" to 1/2") of the inner strands of each cord, then pulling the outer sheath back over and quick melting the end, to prevent fraying, and press flat. The link is just one seller of lanyard supply parts, and you can google for others. Thanks, that's a fitting I didn't know about. I ordered some of the round breakaways you used in the cobra stitch one. BTW, thanks for sharing your knowledge with us, I've made some nice pieces with your help.